1. Forever 21 Plus is fantastic for the transitional new mom wardrobe. Here's a few of my new duds, classic jean dress and a comfy chambray button down. 2. So loving Luna's High Chair - Stokke Tripp Trapp. Highly recommend it! 3. I am engulfed in my current reads The Whole Brain Child and The Ocean at the End of the Lane. I also just finished reading The Honest Life by Jessica Alba which is a lot better than I expected. 4. 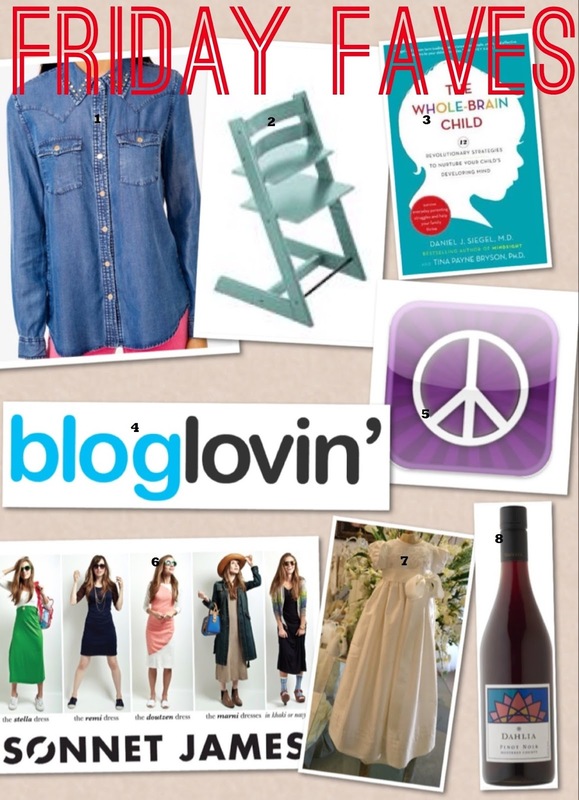 For all those that enjoy catching up on their daily blogs, I recommend Bloglovin. Its addicting! 5. I am obsessing over used baby items! New stuff is highly overrated...with some exceptions of course. I have purchased quite a few things off Craiglist for Luna and I have no qualms about it! 6. & 7. A few more things on my radar are these mommy dresses that are to die for! And I am so excited to start planning Luna's baptism . As you all know, its our in-home date night which I look forward to all week!! What's in your glass tonight? 8. As for me its gonna be this Pinot Noir. Cheers to a wonderful weekend! !